After seeing Tolle on Oprah's Super Soul Sunday, I knew I wanted to read his book, A New Earth. 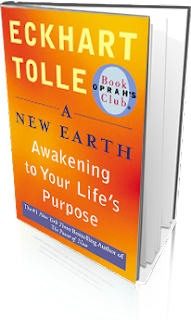 Tolle is also the author of The Power of Now, which many people will be familiar with. I haven't read his first book, however, I have to say, I really enjoyed this book. This book is classified as a spiritual read, and I believe it really crosses all religions and gets into teh space where they all tend to converge. There is nothing exclusionary about this book, no matter what religion (if any) you subscribe to. This is for everyone and anyone who wants to awaken to their life's purpose and connect with the world on a deeper level. Tolle talks about the ego a lot in this book and gives his take on what the ego is and how it functions. I found this to be very interesting, especially after having worked in mental health for years as well as having studied it loosely when I was in college. It's a new take on the ego, and I quite enjoyed it. Tolle seeks to help people expand consciousness while letting go to resentment and ego, and that can only be a good thing. This is the type of book that Mr. Roger's would call "deep and simple." It's quite obvious when you begin to look at what Tolle is saying, that we function so much from the individualistic and egoic states that we don't even realize we are missing the mark entirely. I especially loved the way this book explores the external, which includes possessions. While it may seem obvious, the things that we have and how we define ourselves by them is so pervasive that it has become subtle. I found ways in which I was defining myself that I hadn't been previously aware of, and that awareness is priceless. If you are looking for a read to help you open up, I highly suggest this one. But here's a word of advice in reading it: take it slow. I really took my time reading this book because I wanted to be able to absorb the content. Because it is of that deep and simple nature, blowing through it could find you missing quite a bit...and there are no many little gems in this book, that I also suggest keeping a pen and paper handy to write down your favorite bits. All in all? Read this book if you are spiritual, religious, or just curious. It just may change the way you see yourself...or the world.